Toyota's Akio Toyoda. 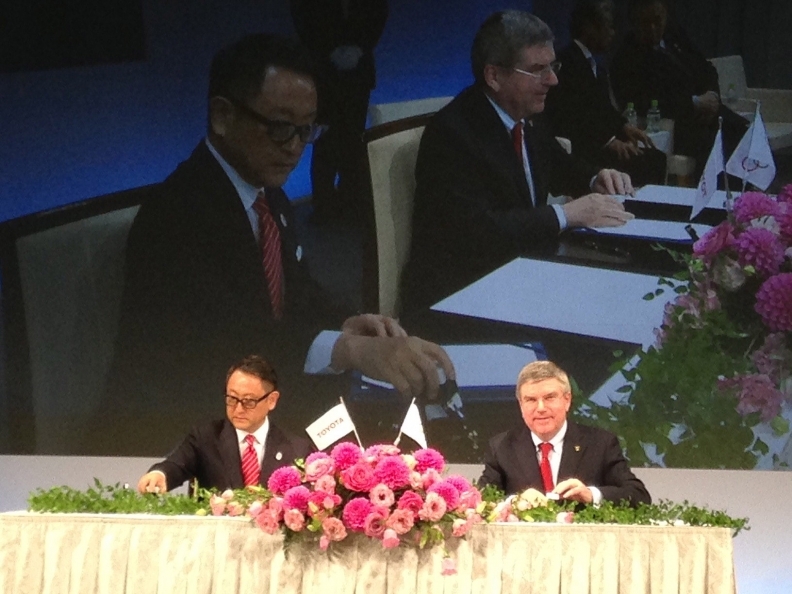 left, and International Olympic Committee President Thomas Bach unveil a long-term sponsorship deal Friday in Tokyo. TOKYO -- The world’s biggest automaker has signed on as a top sponsor of the world’s biggest amateur sporting event. Toyota Motor Corp. announced its support of the Olympics at a news conference Friday hosted by Toyota President Akio Toyoda and International Olympic Committee President Thomas Bach. The contract runs 10 years through 2024, a period encompassing the 2020 summer Olympic games in Tokyo, the Japanese carmaker said. Toyota will sponsor a new category of products to be showcased at the Olympics: vehicles, mobility services such as road safety, and transportation services and mobility support products. The deal means national and global Olympic activities will exclusively use Toyota Motor vehicles. Neither Toyota nor the IOC disclosed financial terms or the dollar value of the sponsorship commitment. Japanese media reports said Toyota will pay $835 million. The cost of becoming a top sponsor at the Tokyo Olympics may be a minimum 15 billion yen ($123 million), Kyodo News reported in January. Toyota’s sponsorship takes effect immediately in Japan through 2016. Its rights will then be extended globally in 2017 following the 2016 Summer Olympics in Rio de Janeiro, Brazil. Toyota will be one of 11 companies with exclusive worldwide marketing rights under The Olympic Partner, or TOP, program. Other carmakers won’t be admitted as TOP sponsors in the period. Toyota will be the world’s first automaker as a top-tier Olympic sponsor and the third Japanese TOP partner. “It is a true honor to represent our industry,” Toyoda said. Japanese electronics giant Panasonic Corp. became a TOP sponsor in 1987. Tire manufacturer Bridgestone Corp. signed on last year. Other TOP sponsors include Coca Cola, General Electric, McDonald’s, Samsung, Visa and watchmaker Omega. Bach said the IOC added a new mobility sponsorship category, considering the logistical challenges facing the games. Toyoda, who played field hockey in college, said sports are a perfect platform for bringing people together and demonstrating the company’s technologies before the world. Toyota and other Japanese carmakers have been considering ways to make the Tokyo Olympics a showcase for their products. But the deal ensures Toyota will dominate the stage. Toyota’s hydrogen-powered Mirai sedan is expected to feature prominently in support roles as an Olympic vehicle, alongside connected cars and autonomous driving technologies. Personal mobility runabouts, such as Toyota’s three-wheeled scooter-like i-Road, will likely be on tap as well. Local media have speculated that athletes will be transported to and from venues in hydrogen fuel cell vehicles or self-driving cars. The Japanese government is backing the push into fuel-cell vehicles as part of a vision to develop a futuristic “hydrogen society” in Japan where hydrogen replaces old fossil fuels. It is building 45 hydrogen fueling stations around major Japanese cities. And the government has earmarked 30 billion yen ($247.3 million) last year and next year to subsidize the introduction of green vehicles, including fuel cell cars.